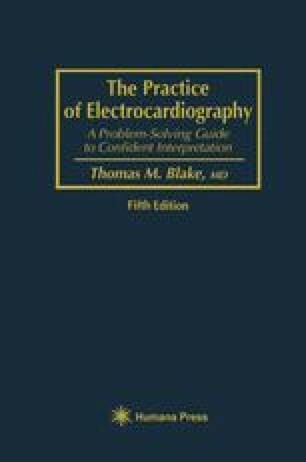 We think of an electrocardiogram as representing electrical activity in the heart, of course, and it does, but that may not be all; the heart is not the only organ in the body that produces electricity. The brain generates voltages too, and so do muscles and the fetal heart, and differences in potential may arise at the skin-electrode interface. In addition, both patient and recording equipment may act as antennae to detect the electrical field, alternating 60 times/s in a polarity, that is almost ubiquitous in our environment. The position of the trace at any moment represents the net of all these, not just information from the heart. Factors other than electricity can influence the tracing, too, especially the skill, attention, and understanding of the technician. A lead labeled II, for instance, is really III if it was made with the arm leads crossed, I if the left arm and leg leads were transposed, and contains no information at all if the right arm lead was attached to the right leg and vice versa (p. 104), and all these human errors are common. Deflections caused by extracardiac activity or technical error are called artifacts, and may arise in any part of the system—the patient’s body, the recording equipment, computers, facsimile machines, and telephone lines.